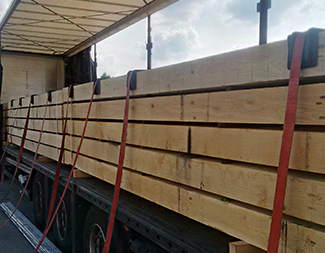 Daily, 60 to 100 m3 of local hardwoods are unloaded on Grouazel sawmill's yard. 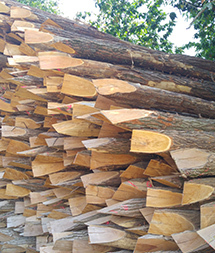 At this place will be decided about final destiny: structural beam for frame building or any timber construction for landscaping, Oak boules for barrels manufacturers, joiners or merchants, Oak square edges for the furniture industry, flooring or joinery components, chestnut square or robinia (false acacia) square edges for cladding or decking... each single log is checked, sorted and trimmed according its grade and current customers requirements, which are as various as what the forest gives us. 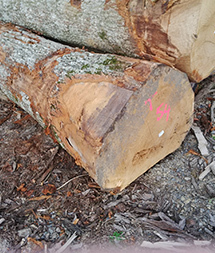 Timber merchants, craftsmen of the timber frame industry or involved in the landscaping layout, main contractors for structures such as bridges, walkways, railways, banks sustainment..., they all are using rough hardwoods. 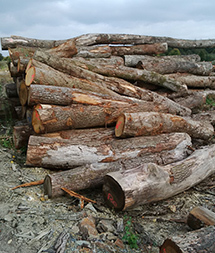 Their intrinsic qualities make additional treatments often useless and ensure an optimized yield by the construction and high durability of use when the logs have been selected for the right purpose. 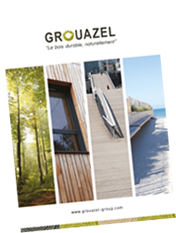 Thanks a relevant and strict selection of the logs and it's heavy and performing equipment, Grouazel sawmill answers quickly and with efficiency to all inquiries about rough French oak, chestnut and robina timbers.